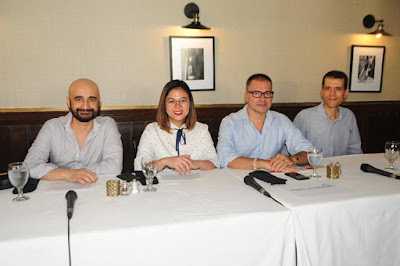 In celebration of the 70th anniversary of the diplomatic relations between Italy and the Philippines, a selection of films from the oldest and most important film festival in the world, the Venice International Film Festival, was brought to Manila in 2017. It was a ‘premiere’ in the Philippines as well as in the whole ASEAN region. 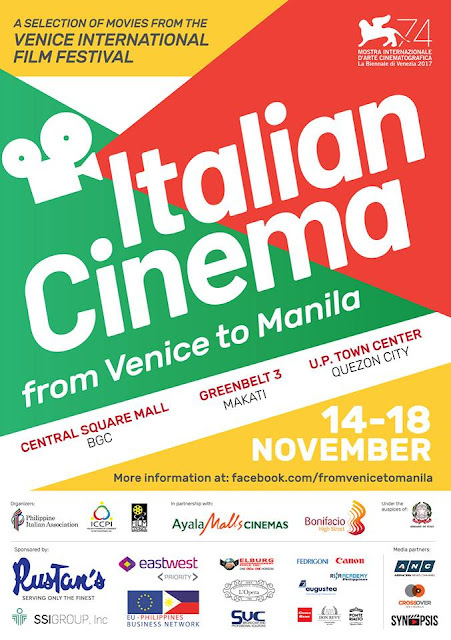 Following the success of the first edition, the Italian Chamber of Commerce in the Philippines and the Philippine Italian Association, together with the Film Development Council of the Philippines under the auspices of the Embassy of Italy in Manila, are proud to present the second edition of “Italian Cinema from Venice to Manila, a selection of movies from the Venice International Film Festival”. The second edition of this signature Italian film festival is set to grow in size and to expand its audience reach. 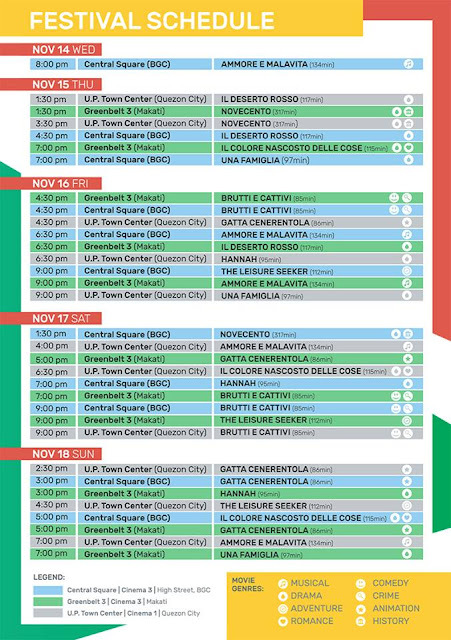 Thanks to partnership with Central Square, Ayala Malls Cinemas and FBDC, the Italian movies will be screened in 3 different cities of Metro Manila: Central Square in Bonifacio High Street (BGC, Taguig City) at where the festival will open on November 14 and, by the following day, in Greenbelt 3 (Makati City), and at U.P. Town Center (Quezon City). The 9 films that will be screened for Metro Manila film aficionados this year, participated in the 74th Venice International Film Festival and were chosen for their outstanding qualities. 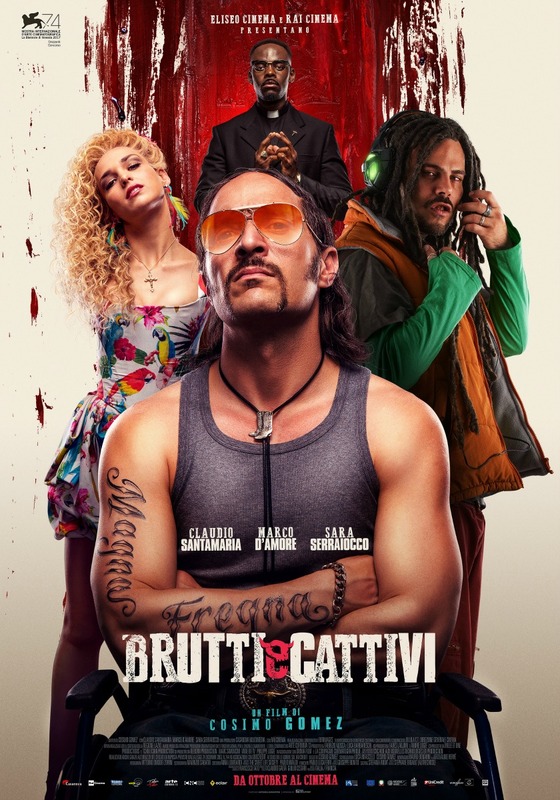 Directors the Manetti Brothers on their film, Ammore e malavita (Love & Bullets): "If a killer working for the camorra is told to bump off a woman and recognizes in her the love of his adolescence, are we talking about love or the world of crime? This is where we started out and the story came afterward, almost by itself. Songs accompany the fundamental and most emotionally powerful moments of the story: they are sung when two characters are about to kiss, but during a shootout too. The genre of the musical has allowed us to go over the top, tackling profound and important themes like love and death while maintaining a light and spectacular tone. We are not aiming for realism, but plausibility. In order to believe in the story we are telling we like to take real characters, whom we have met in real life, and set them in the fanciful frame of an exaggerated tale. The city of Naples has been our inspiration and the result is a personal revisiting of its most charged and popular art form, the sceneggiata or Neapolitan melodrama. But let’s be clear, the message of the film is not: “this is what happens in Naples.” What happens, happens only in our story. Our Naples is not just the gloomy and despairing city as it has lately been portrayed in the movies or on TV, but also a Naples that, in spite of all its problems, stimulates with its cultural ferment and inspires with its sense of humanity. Every time we go back it inevitably makes us smile. Whatever our mood. An incomparable power." Brothers in life and fellow adventurers in their profession, Marco and Antonio Manetti form the cinematic partnership of the Manetti Bros. Both are directors and screenwriters, they made their debut in 1995 with a Consegna a domicilio, segment of the film DeGenerazione. In 2000 their Zora la vampira was released in movie theaters, where it was followed by, among others, Piano 17, Paura 3D and L’arrivo di Wang. But it was in 2013 with the film Song ‘e Napule that they won the unanimous acclaim of the critics and the public. Engaged in making dramas for television as well, the brothers have directed, among others, the cult series L’ispettore Coliandro. Active in production for the web too, they have made over a hundred video clips for some of the best-known faces in Italian music. Una famiglia (A Family) is the story of a couple, Vincent and Maria. Vincent was born near Paris, but has cut off every link with his roots. Maria, fifteen years younger, grew up in Ostia, but no longer sees her family. Together they form a couple that does not seem to need anyone. They lead a secluded life in contemporary Rome, indolent and distracted. Furthermore, Vincent and Maria are good at blending in with their environment. When they return home, they make love with the passion of young lovers in a suburban apartment that she has carefully furnished. Yet, on closer inspection, their everyday life betrays what lies behind their seemingly normal appearance: a project carried out by him with a clear determination and accepted by her only by virtue of unconditional love. A plan to help couples who cannot have children. Maria decides that it is time to create a real family. This choice has an inevitable consequence: the rebellion against Vincent, the man of her life. At the Venice Film Festival 2017, Una famiglia was nominated for the Golden Lion award for Best Film and director Sebastiano Riso was nominated for the Queer Lion award. The Italian National Syndicate of Film Journalists also nominated this film for the Silver Ribbon for Best Original Story. 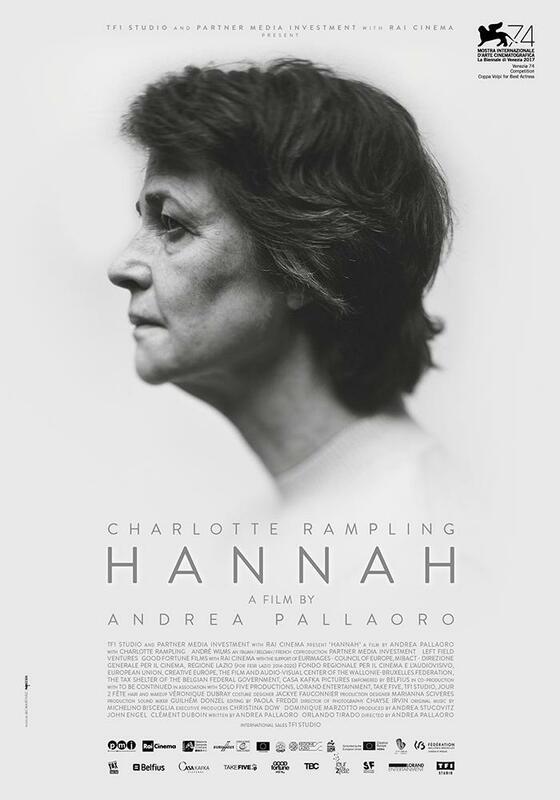 At the Venice Film Festival 2017, Charlotte Rampling won the Volpi Cup for Best Actress, while director Andrea Pallaoro was nominated for the Golden Lion Award for Best Director. At the Chicago Film Festival, the film won the Silver Hugo award for Best Cinematography and was nominated for the Gold Hugo award for Best Feature. 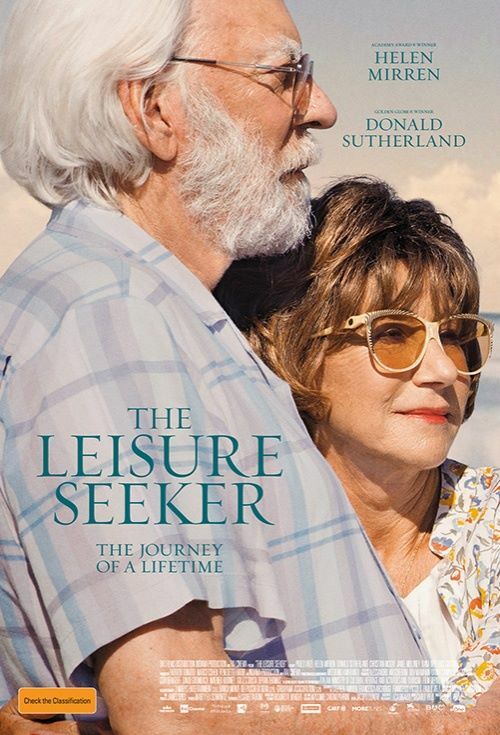 At the Venice Film Festival 2017, The Leisure Seeker was nominated for the Golden Lion award for Best Film. Helen Mirren was nominated for Best Actress at the Golden Globes (USA) 2018. The film also was nominated for Best Cinematography and Best Screenplay at the Golden Globes (Italy) 2018. Director Paolo Virzì won the International Silver Ribbon from the Italian National Syndicate of Film Journalists 2018. Il colore nascosto delle cose (Emma) is a film about Teo, a man on the run. From his past, from the family of his birth, from the beds of women he has spent the night with and from which he slips at the first light of dawn, from responsibilities. Work is the only thing he truly loves. He is the ideas man of an advertising agency and never calls it a day. Tablet and cellphones keep him in permanent and compulsive connection with the world. Emma lost her sight at the age of sixteen, but has not allowed her life to slide into darkness. Or rather, she has grabbed hold of it, come to blows with her handicap and then accepted it with the awareness that every day is a battle. She works as an osteopath and moves around the city with her white cane, independent and determined. She split up with her husband a short time ago and Teo, witty and carefree, seems like just the right person for a fling. For Teo on the other hand, it is all a matter of play and challenge. Emma is different from all the women he has met before and he is attracted and intimidated by her world. They are surprised by a breath of lightness, but their joyful idyll comes to an abrupt end. Each goes back to own life, but nothing will be the same as before. Il colore nascosto delle cose was nominated for Best Film at the Swiss Film Prize 2018 and for Best Editing at the Golden Ciak Awards 2018. Valeria Golino was nominated for Best Actress at the David di Donatello Awards 2018. Gatta Cenerentola (Cinderella the Cat) is a product of innovative Italian animation. Cinderella has been raised on Megaride, a huge ship which has been docked in the harbour of Naples for over 15 years. Her father, the rich owner of the ship and a scientist, has died, taking the technological secrets of the ship and the dream of the harbour’s rebirth to the grave. Since then, the young girl has lived in the shadow of her terrible stepmother and her wicked six daughters. The city has degenerated into decline and entrusts its last hopes to Salvatore Lo Giusto, AKA ‘o Re, an ambitious drug dealer who, in agreement with the stepmother, exploits the unsuspecting Cinderella’s inheritance to transform the port of Naples into the capital of money laundering. The ship, infested with ghosts-holograms of a forgotten technology and story, will become the theatre of the whole plot, staging the epochal clash between the misery of today’s ambitions and the nobility of the past’s ideals. The young Cinderella’s future and that of the poor city of Naples are linked by the same, thin thread. 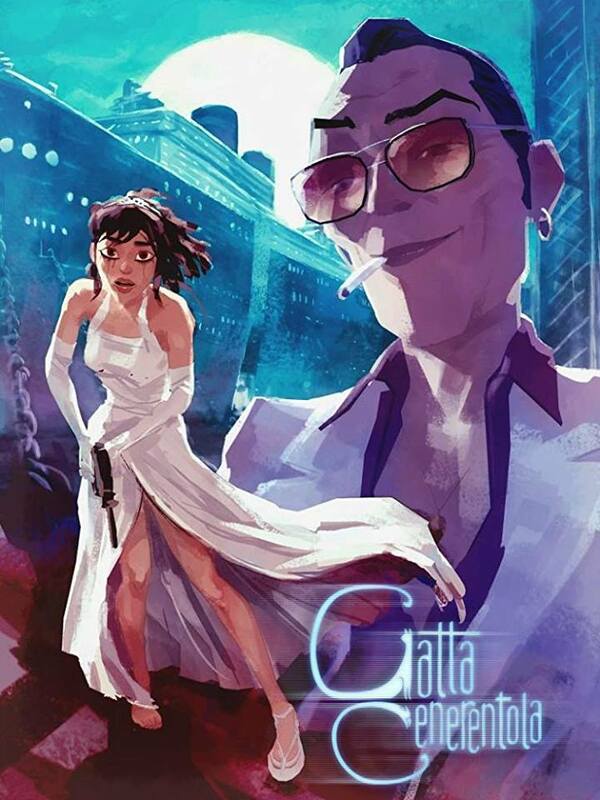 At the Venice Film Festival 2017, Gatta Cenerentola was nominated for the Venice Horizons Award for Best Film. At the David di Donatello Awards 2018, it won awards for Best Producer and Best Visual Effects, while being nominated for Best Film, Best Music, and the Youth Award. It won the Grand Prix MONSTRA Feature Film at the Monstra International Film Festival 2018 and the Italian National Syndicate of Film Journalists awarded it a Special Ribbon for its quality, innovation, and productive courage. 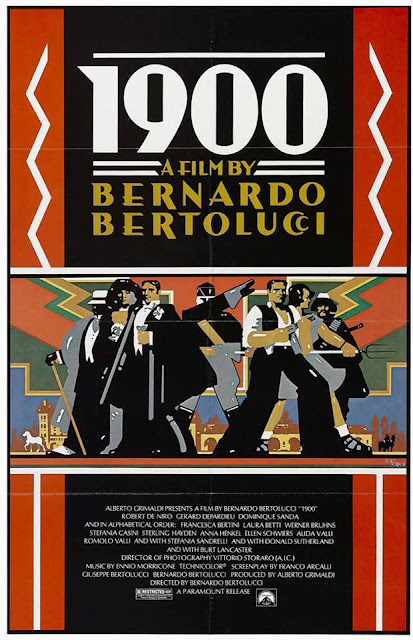 Director Bernardo Bertolucci on his film, Novecento (1900): "For me Novecento is a microcosm, as Strategia del ragno had been to some extent, before it. If you look at a speck of dirt under the microscope it is as if you were looking at the universe in the great planetarium of a film by Nicholas Ray. A speck of dirt makes you dream and the microcosm of Novecento really ought to be like that: a tiny region of Italy much enlarged and thus in some ways made— horrible word—universal." Son of the poet Attilio Bertolucci, Bernardo was born in Parma in 1941. In 1952 he moved to Rome with his family. In 1961 he was first assistant director to Pier Paolo Pasolini on Accattone. He made his directorial debut with La commare secca (1962), based on a story by Pasolini. 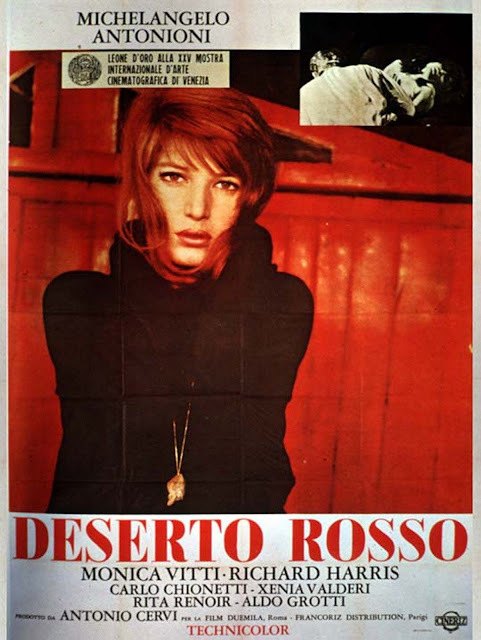 In 1964 he made Prima della rivoluzione, a semiautobiographical work with which he began the discourse on existential and political ambiguity that ran through his films of the early seventies, like Partner, Strategia del ragno and Il conformista. He achieved enormous success (and caused a great scandal) with Ultimo tango a Parigi (1972) and with the historical epic Novecento (1976). The Last Emperor (1987) won a total of nine Oscars. After The Sheltering Sky and Little Buddha, he returned to Italy in the nineties to make the films Io ballo da sola and L’assedio. In 2003 he shot The Dreamers, a moving reexamination of the events of 1968 in Paris, and in 2012 be brought out Io e te. Among the numerous awards Bertolucci has received, the Golden Lion at Venice in 2007 marking 75 years of the history of cinema, the Honorary Palme d’Or at Cannes in 2011 and the EFA Lifetime Achievement Award in 2012. In 2013 he chaired the jury of the 70th Venice Film Festival. All these films will be screened in the three cities and will be accessible at the discounted price of PhP150. Another feature of this signature festival is the launching of an educational component: three (3) Italian film experts will hold a series of masterclasses at the Film Institute of UP Diliman, at the School of Design and Arts of Saint Benilde (Digital Filmmaking program) and at the Cinematheque central of the Film Development Council of the Philippines. The great Italian director, Federico Fellini, once said: “Un linguaggio diverso è una diversa visione della vita” (A different language is a different way of seeing life). We firmly believe in this and, through the language of cinema as well as the language of Italy, we are committed to give our festival goers this wonderful opportunity to see life through Italian eyes. Italian Cinema from Venice to Manila is made possible by the generous support of the Gold Sponsors: Rustan’s, SSI, EastWest Priority; Silver sponsors: Elburg, L’Opera (Italian Restaurant), Sony; and other sponsors: Ponte di Rialto ristorante italiano, China Bank, Don Revy, Rina Academy, Augustea, Fedrigoni and Canon. Media partners: ANC, Crossover 105.1, Synopsys. Venue partners: Central Square, Ayala malls cinema, Fort Bonifacio Development Corporation. The Educational component and the Production tour is made possible by the generous contribution of the European Philippine Business Network (EPBN) and the partnership with AIC (Associazione Italiana Autori della Fotografia Cinematografica) and ACMF (Associazione Italiana Compositori Musica per Film).